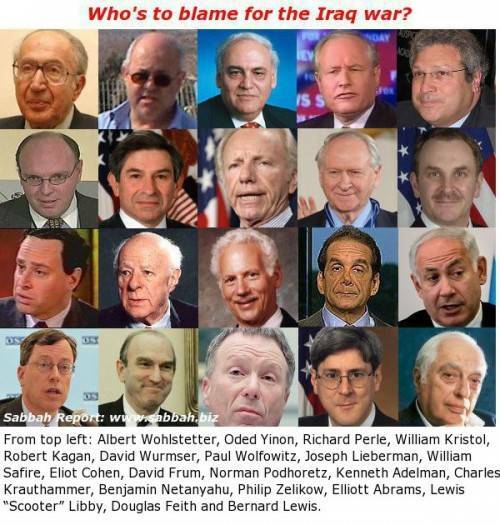 Those to Blame for Iraq, Now Want Iran. Not Again! Allan Brownfeld, Publications Editor at the American Council for Judaism, names exactly who was behind the US war against Iraq and makes the case for why the US shouldn’t fall for it again. Many neo-conservatives have close ties with Israel’s right-wing. Prominent neo-conservatives Richard Perle, Douglas Feith, James Colbert and David and Meyrav Wurmser wrote a memo to Netanyahu in 1997 entitled “Clean Break,” which recommended the reordering of the entire Middle East to the benefit of Israel. Brownfeld lays it all out, in plain and simple language. The US political machine has been bought out. An excellent read that should be shared and shared again, until no one in America or the world doesn’t know about it. The U.S. permitted neo-conservatives and the Israel lobby to take us to war with Iraq on false premises and with disastrous results. To permit them to lead us down this path once again, this time with Iran, would be a repetition of folly.